Los Angeles – April 17, 2012 – T.D.J. Enterprises / T.D.J. 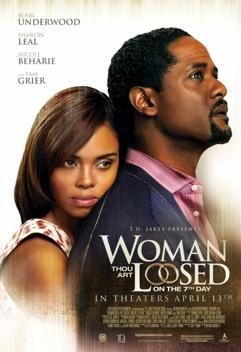 Independents, along with Codeblack Entertainment and AMC Theatres®, today announced that in limited release “Woman Thou Art Loosed! : On The 7th Day,” a Neema Barnette film, earned $6,376 per screen and grossed $641,542 its opening weekend. Surpassing industry expectations, “Woman Thou Art Loosed! : On The 7th Day” outperformed all other films in release on per screen average and finished the weekend as the #1 independent feature. “Our TDJ Independents division allows us to develop a slate of strong inspirational content produced on smaller budgets by independent filmmakers,” said T.D. Jakes. “Woman Thou Art Loosed! : On The 7th Day” opened on 102 screens as a part of an exclusive release with AMC Theatres® under AMCi, a program specifically designed for independent films. Jeff Clanagan, CEO of the film’s distributing company, Codeblack Entertainment, plans to expand “On The 7th Day” to more cities the weekend of April 27-29. “I have great appreciation for Bishop T.D. Jakes and his vision and I am grateful to AMC Theatres for providing a program that allows independent filmmakers to bring their work to mass audiences,” said Clanagan. Executive produced by T.D. Jakes for T.D.J. Independents, the film is the second installment from Jakes’ Woman Thou Art Loosed! franchise and stars Golden Globe® nominee Blair Underwood (“Madea’s Family Reunion”, “Set It Off”), Sharon Leal (“Why Did I Get Married Too?”), Nicole Beharie (“American Violet”), Nicoye Banks (“Law & Order”) and Emmy Award® Nominee Pam Grier (“Just Wright”). This weekend’s success of “Woman Thou Art Loosed! : On The 7th Day” also places it as the second highest grossing film opening weekend under the AMCi program, second to “Laugh At My Pain,” which is also a Codeblack Entertainment distributed film.